As a dog expert, I am frequently asked to opine the most aggressive breeds of dog. Many seek answers to this question. Not surprisingly, however, there are reasons why this apparently simple question cannot be answered in a straightforward manner. First, the term “aggression” can mean different things to different people. What may seem to be a dog’s aggressive action by one person may not be interpreted the same by another. For example, people may be inclined to interpret various actions of a pit bull as aggressive in nature when in fact they are not. Second, different breeds are more inclined to display certain kinds of aggression. The various kinds of aggression are often specific to the breed. Hence, partially for these reasons, it may be misleading to suggest that one breed is necessarily more “aggressive” than another. Nonetheless, there are published studies which address the question of breed differences in canine aggression. One of my favorite studies was reported by a group of animal behaviorists at the University of Pennsylvania (Duffy, D., et. al. Breed differences in canine aggression. Applied Animal Behavior Science, 2008, 114, 441-460). This study is somewhat dated but still relevant. This study gathered a massive amount of data on aggressive tendencies from more than 30 different purebred dogs (mix breeds were not included) with a widely used instrument known as the Canine Behavioral Assessment and Research Questionnaire. The questionnaire was administered to two groups of participants: respondents on the Internet and a random sample of breed club members. Golden retrievers, Labrador retrievers, Bernese Mountain dogs, Brittany spaniels, Greyhounds and Whippets with the least aggressive breeds, both humans, and other dogs. English springer spaniels bread for confirmation (i.e. appearance for the show ring) more aggressive towards humans and dogs when compared with English Springer spaniels bred primarily for field work. However, the opposite was found for Labrador retrievers. Namely, confirmation-bred labradors were less aggressive towards humans when compared with their field-bred counterparts. Hence, distinct differences were found between breeds with regard to their aggressive propensities. In sum, overall the study found that smaller breeds such as the Jack Russell terrier, chihuahuas, and dachshunds were the most aggressive and that larger breeds such as Golden retrievers, Labrador retrievers, Bernese Mountain dogs, Brittany spaniels, and Greyhounds were the least aggressive. The results also indicate that a breed’s aggressive tendencies must be differentiated according to the target; namely, whether it be a familiar person, or an unfamiliar person or dog. Moreover, for Labrador retrievers and Springer spaniels, the function for which the dog was bred (fieldwork vs. appearance) was found to significantly impact aggressive tendencies towards humans. I was also struck by the lack of evidence suggesting that the larger breeds frequently portrayed in the press as being a potentially dangerous breed, such as Rottweilers, and Pit Bulls and various mastiff type dogs (e.g. Cane Corso, Presa Canario) were not found to be the most aggressive. 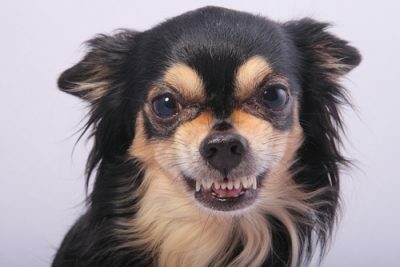 Rather, smaller breeds like the chihuahua were found to be the most aggressive. Pit bulls (identified in the study as being either the American Staffordshire terrier or the American Pit bull terrier) were found to be especially aggressive towards other dogs. This is not surprising: pit bulls were initially developed to attack other dogs and not humans. This study also suggests that a chihuahua is more likely to bite a person than a pit bull. And this is consistent with my impressions from over 30 years of clinical practice: chihuahuas are probably the craziest breed I have encountered. Many Chihuahuas have been bred indiscriminately and this has caused many individuals within the breed to become fearfully aggressive and skittish. However, does this necessarily mean that all chihuahuas are ill-tempered and unusually aggressive by nature? Absolutely not. Tremendous differences exist between individuals. One should not lose sight of the fact that findings from this study address only the importance of genetics on various kinds of canine aggression. And more recent studies confirm these results. These findings must be tempered by a basic realization; namely, an individual’s aggressive tendencies are determined not solely by genetics but rather by the interplay between genetics, environmental factors, past experience, how a person reacts to a dog, and owner responsibility. Whether we are talking about chihuahuas, pit bulls or any of the other so-called dangerous breeds, basic truisms emerge from the study reviewed in this post. Namely, (a) the strong impact a dog’s genetic makeup has in determining tendencies for aggressive behavior and (b) the importance of the target to which a dog’s aggressive behavior is directed. It would be foolhardy not to consider these factors when answering the general question about “which dog breeds are the most aggressive”. Dr. Polsky is a dog expert located in Los Angeles, California. He welcomes inquiries from attorneys handling litigation involving personal injury caused by canines.